Elon Musk is proposing an ambitious space program to establish “a sustainable human presence on Mars,” with up to a million people by 2060, apparently on the assumption, premonition, or fear that earth may require an escape valve, or that capitalism may be unable to solve its own internal contradictions limited as it now is to the confines of this small planet. “I think there is a strong humanitarian argument for making life multi-planetary…in order to safeguard the existence of humanity in the event that something catastrophic were to happen.” “I think that Mars is gonna be a great place to go,” he says. (It’s going to be a terrific place! The best place!) “It will be the planet of opportunity.” No longer are there territories (like the American West) or countries (like China) as lands of opportunity or zones of appropriation, we must now look to the planets. This vision comes with a few problems. Mars is a dead planet. Nothing grows there, there is no visible above ground water, the atmosphere is 95% CO2 and the average surface temperature is -67F. It cannot sustain human life without an enormous and costly technological support system that would have to be maintained over several generations. Life on Mars would be as artificial and constricted as life on the international space station, without the option of escape. One test of Mr. Musk’s vision would be for him to raise several billion dollars and apply his ideas to a country in Africa. Try to help the people of Mali or Niger restore their arid and increasingly desertified lands. This would help the country, and be proof of concept that reviving dead planets can actually be done, because the problems in Niger and Mali must be easy compared to Mars. 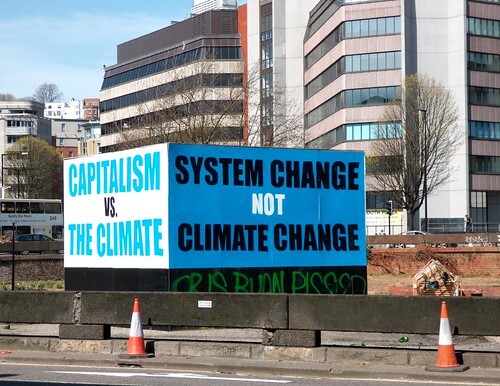 But in truth, capitalism is better suited for extracting, transforming and destroying eco-system values than in conserving, sustaining or restoring them. There is no profit to be had from the arid lands of Mali and Niger, absent fossil fuels or some other mineral valuable to western countries, any more than there will be in trying to resuscitate the barren landscape of Mars, movie fiction notwithstanding. Back here on earth, the Trump administration has launched a full-scale assault on our life support systems, approving measures and eliminating regulations that will accelerate our planet along a path that could eventually see a convergence with the environmental conditions of Mars, or as David Wallace-Wells has written, make the Earth “Uninhabitable.” Instead of imagining that one day Mars could look like Earth, let’s imagine that Earth could end up looking more like Mars, if we stay on our present course. There are many ways our economic system is making our home planet unlivable; it’s not just about climate change and global warming. It includes a complex of industrial and commercial practices that threaten our life support systems. It starts with the humble honeybee. Albert Einstein is reported to have said, “If the bee disappeared off the face of the earth, man would only have four years left to live.” Falsely attributed to Einstein, it seems to originate instead with Maurice Maeterlinck, a Nobel Prize winner from Belgium, in his monograph, “The Life of the Bee.” This reattribution certainly removes some of its weight, but no one really knows if the human species would die out if honeybees became extinct. The vital role honeybees play in agriculture as pollinators, and their commercial exploitation for this purpose is well known, however. Most farmers don’t depend on naturally occurring bee populations to pollinate their crops. Bees are trucked in to do the job. In the six years leading up to 2013, more than 10 million beehives were lost to colony collapse disorder (CCD). Although not scientifically confirmed, many experts believe that the stresses on bee colonies from commercial, migratory beekeeping operations result in disorientation as well as exposure to pesticides, parasites and other diseases. A recent reversal by the EPA on regulations to protect honeybee colonies from pesticide spraying will only aggravate the threats to bee populations. Keep an eye on the bees. What happens to them may happen to you. While people may assume that access to clean water is a fundamental human right and public good, the CEO of the Nestle Company, Peter Brabeck-Letmathe, believes that “access to water is not a public right,” and should be privatized and commodified, just like oil. This should give a sense of comfort to the billions of people around the world who live in utter poverty, lacking both clean water and adequate nutrition. WHO and the United Nations report that water borne diseases are the world’s number one killer, resulting in more than 3.4 million deaths every year. Some 4,000 children die each day as a result of diseases caused by ingestion of filthy and contaminated water. In the US, the Centers for Disease Control (CDC) estimate there could be “4 to 32 million cases of acute gastrointestinal illness (AGI) per year from public drinking water systems,” although “the overall prevalence of waterborne illness in the U.S. is unknown.” It is an alarming commentary that the CDC doesn’t have more reliable data on the prevalence of water poisoning in the US. Drinking water contamination from fracking has been widely reported in the US, although the EPA seems unable to determine how pervasive the problem is. Congressional Republicans axed a regulation to prevent coal-mining debris from being dumped into nearby rivers and streams and are rolling back rules against methane gas pollution from oil-gas flaring. As icing on the cake, they also rescinded a rule requiring companies to disclose payments (aka bribes) made to foreign governments involved in mining and drilling. Nutrients, such as nitrogen and phosphorus, from large scale agricultural operations, urban runoff and airborne pollutants pose a serious water pollution threat to the health of lakes, streams and US coastal waters. Livestock production is a major source of land based nutrient pollution. Effluents from intensive livestock operations are often discharged into the environment or stored in vast lagoons, which can burst during storms and floods spilling toxic waste into nearby streams, rivers and groundwater supplies. This can result in the eutrophication of surface water, leaching of nitrates and pathogens into groundwater, buildup of excess nutrients and heavy metals in the soil, contamination of soil and water resources with pathogens, release of ammonia, methane and other gases into the air, destruction of fragile ecosystems such as wetlands, mangrove swamps and coral reefs. For more, please see this link and this link. China, among other countries, faces a serious threat of industrial based air pollution. China tops the WHO list for the most deaths from toxic air pollution, affecting more than 1 million people a year, but all countries are touched by it. India has now jumped to the top of the charts, with 1.1 million deaths per year from air pollution according to a recent report in the NY Times. Common air pollutants include organic solvents, sulfur dioxide, nitrogen oxides, carbon monoxide, lead, methane, and CO2. But the most deadly form of air pollution consists of ultra fine particulate matter, 2.5 microns in size, known as pm2.5s, which is able to penetrate the lungs and enter the blood stream. In 2012 more than 38,000 people in the US died from particulate air pollution. Air pollution, climate change and population growth are all implicated in threats to the world’s food supply. Increased temperatures and poor air quality could reduce crop yields anywhere from 10 to 15 percent in the coming years and could be much worse for countries already facing poor crop yields. Current levels of food waste also represent a huge deficit in our ability to feed people. According to the Food And Agricultural Organization (FAO), about one third of all food is wasted. “If this waste were eliminated, there would be enough food to feed an additional 2 billion people, without changing anything else.” But even if this were possible, it would not be enough to meet the projected 50% increase in food demand by 2050 when world population is expected to reach 9 billion. It is indeed mystifying that right wing officials, politicians and their followers persist in denial when proof of climate change is visible on an almost daily basis. Just ask the victims of hurricanes Harvey, Irma and Maria. Even before the hurricanes, the people of South Florida were “paying the price for climate change as salt water pushed through porous bedrock into coastal drinking-water supplies.” In some part, it may be willful blindness in Upton Sinclair’s sense that it is hard to get people to understand something, when their paycheck depends on them not understanding it. For some people, it may be because many of the effects are widely separated in space and time and their cumulative impact is not immediately obvious, until we reach a tipping point when a cascade of destruction becomes unavoidable and obvious. You might think that the increase in massive storms and flooding across the country would be a wake-up call, but apparently not. It is bizarre indeed that there is nothing about the natural world that conservatives seem ready to conserve, if it stands in the way of corporate profits. But, denial is more likely due to the well-financed campaign by “fossil-fuel interests, together with their influential Republican allies, to attack well-established research on topics like global warming.” The energy industry “spends about $300 million a year lobbying Congress, … with three lobbyists for each member.” It spent $160 million during the recent election cycle with 80 percent going to Republicans. It is an article of faith in these circles that any government regulation, especially environmental regulation, is an unwarranted interference in the free market, something they never speak about, of course, if a subsidy or bailout is required. The Republican Party has been largely mute about a proposal by James Baker, to adopt carbon taxes as “a conservative climate solution based on free-market principles.” Give Baker credit for recognizing and providing one possible approach to the problem. Carbon emissions trading, which was endorsed at one point by some business groups, is another. We in the developed world enjoy our comfortable life styles, in part, because nearly half of the world lives in poverty, and many of their countries, particularly in Africa, serve as resource reserves for us, the wealthy. It must be an extraordinary case of mass hypnosis that a small group of men can own or control most of the world’s above and below ground resources, which they claim to be exploiting for our benefit, but actually for their profit. We should be clear that the wars and conflicts now going on in the Middle East and other places have nothing whatsoever to do with religion, or any fictitious clash of civilizations; it’s about power, politics and control of natural resources. Under the man-made rules of private property, there is no idea that these resources belong to humankind. In addition to a global agreement on climate change, we need a global agreement on use of the world’s natural resources, a negotiated system of sharing rather than continued proxy wars for control of other people’s resources. In public, many of our business and economic elites acknowledge the long-term dangers posed by climate change and environmental damage, but then turn around and donate huge sums to political candidates and parties whose principal aim is to thwart any efforts at real change. “By glorifying the pursuit of self-interest by individuals and corporations,” our economic system has, “created a world where material enrichment absolves individuals and corporations of other responsibilities to society. In the process, we have allowed our bankers and fund managers, directly and indirectly, to destroy jobs, shut down factories, damage our environment and ruin the financial system itself in the pursuit of individual enrichment.” With an economic system focused almost exclusively on short-term gains, where are the incentives, and the leaders who are prepared to act for generations yet unborn? It is not about saving the planet, or protecting the environment; it’s about saving ourselves, because personally, I think we have much better chances here than on Mars. Lowell Flanders is a former UN official who works as an independent photographer in New York City. This entry was posted in All Posts News Politics and-or Videos, Capitalism, Environment, Oil and/or Fossil Fuels and tagged Agriculture, Bees, Climate Crisis, Donald Trump, Elon Musk, Fracking, Lowell Flanders, Mars, Pollution, Same As It Ever Was, Water. Bookmark the permalink. To get a million people to Mars by 2060, they’re gonna have to average 60 people a day between now and then. This is a terrific overview. Many thanks for associating my local snapshot with it, I feel humbled. I also feel motivated to find out who put up the original hoarding – in a locally significant place called the Bearpit in Bristol, a city where I am proud to live. In addition , I am now keen to read some Karl Polanyi. Thank you, Sam for allowing us bloggers to use your fine work freely. It’s very much appreciated. I thought your photo fit perfectly with it. Glad you enjoyed this article, too.